The mysteriously titled project might just as well have been called "9/11: The Thrill Ride," so thoroughly does it trade on our emotions of that disaster. 84 min. Paramount Pictures. Director: Matt Reeves. Cast: Lizzy Caplan, T.J. Miller, Michael Stahl-David, Mike Vogel, Odette Yustman. Remember when the mere sight of the World Trade Center was offensive? Spider-Man had to remove an action sequence involving the Twin Towers, and a score of other New York-set films digitally erased the WTC so as not to bring up raw emotions. That kind of reactionism made sense in some cases and not in others, but regardless those days are over. Now it's fashionable to remind audiences of 9/11 (and not just if you're Giuliani). Heck, if Paramount couldn't make New York disaster movie Cloverfield, the terrorists won! More on 9/11 anon: Cloverfield—a technically proficient achievement to be sure—is the postmodern, post-Jaws Godzilla movie that eluded Roland Emmerich in 1998. Of course, so was The Host and, so, to some degree, was The Mist. What's freshest about Cloverfield is the hype: a teasing PR campaign that has audiences salivating for—nay, demanding—something they've already seen many times before. Though the film is written and directed by longtime collaborators, the stamp of executive producer J.J. Abrams is evident in the film's young, pretty twenty-something romantic angst and its blend of genre intensity and colloquial humor. Screenwriter Drew Goddard and director Matt Reeves present the entire disaster flick from the point of view of government-seized camcorder footage (admirably, they never compromise this stylistic conceit). For maximum emotional effect, the government evidence is unexpurgated, and as such begins with footage materially irrelevant to the attack in question. A happy young couple—Rob (Michael Stahl-David) and Beth (Odette Yustman)—awake from a night of bliss to spend a happy day together. The scene fizzles away, replaced by preparations, a month later, for Rob's bon voyage party (the fragmentation of taped-over video will continue to be cleverly exploited). Rob and Beth are uncomfortably no longer a couple, and Rob has accepted a corporate vice presidency in Japan. The question I've been most asked since seeing Cloverfield—other than "Is it any good? "—is "So what is it?" Isn't one monster as good as another? Perhaps not. This one's design is the laughable result of the injunction "Make it different than anything we've ever seen before!" The leathery, tentacled, amphibious creature looks like a Frankensteinian sew-job of bits of everything we've seen before. Taking a page from the Spielbergian playbook, Reeves only allows glimpses from Hud's shakily held camera until delivering a climactic head-to-toe money shot of the beast. It all works over the audience like gangbusters, with armrest-gripping exciting and the kind of masterful storytelling economy you'll only pick apart later in the evening. But the mysteriously titled project might just as well have been called "9/11: The Thrill Ride," so thoroughly does it trade on our emotions of that disaster. Here too are collapsing high-rises, billows of dark smoke, and dazed New Yorkers in the middle of debris-laden city streets, all captured from the P.O.V. of on-the-fly consumer video. "People need to see this," Hud says. "This is important." Hud's line dovetails with an earlier one spoken by Beth: "I can just see this ending up on the internet." Added to Robert's "This is like a nightmare," the dialogue lacks only "It's like watching a movie" to complete the circuit of 9/11 meets YouTube relevance; score one point for restraint. The same can't be said of the end credits. After an unscored narrative, Abrams' personal composer Michael Giacchino supplies a tongue-in-cheek, jarringly bombastic blockbuster movie overture ("Roar!") that adds to that bad taste of exploitation in your mouth. 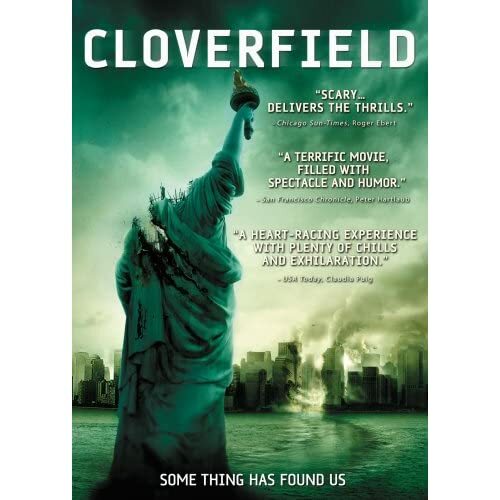 Cloverfield's viral marketing strategy continues on Blu-Ray and DVD, with no less than eleven embedded "easter egg" features, as well as an audio commentary by director Matt Reeves, and a trove of featurettes and outtakes. I was a bit skeptical—given the nature of the film's visuals—that Blu-Ray would offer a significant improvement in picture quality, but it does: the Blu-Ray transfer offers considerably sharper detail, as well as the monstrous audio (in this case, that's a good thing) of the 5.1 Dolby True-HD soundtrack. Blu-Ray also offers up an exclusive: a pumped-up trivia track dubbed the Special Investigation Mode. In this mode, the film goes into the upper right corner of the screen, with military intelligence (from the world of the film's story) in the lower right, and on the left side of the screen a map of Manhattan with GPS tracking of the monster and the humans, as well as a radar screen responsive to the creature's moves. Pretty cool, and al of the audio options remain available, so you can listen to the commentary in this mode. "Document 01.18.08: The Making of Cloverfield" (28:18) gathers Reeves, executive producers J.J. Abrams and Sherryl Clark, producer Bryan Burk, camera operator Christopher Hayes, editor Kevin Stitt, special effrects coordinator David Waine, first assistant camera Wally Sweeterman, special effects supervisor Josh Hakian, animal trainer Tom Gunderson, animatronic effects supervisor Andrew Clement, visual effects supervisor Kevin Blank, assistant technical advisor Tom Minder, director of photography Michael Bonvillain, stunt coordinator Rob King, production designer Martin Whist, and 2nd assistant director Katie Carroll. Oh, and actors Michael Stahl-David, Mike Vogel, Jessica Lucas, Brian Klugman, Margot Farley, T.J. Miller, Lizzy Caplan, and Odette Yustman have something to say as well. The doc ranges from the June 14, 2007 production meeting to the wrap of principal photography after 34 days of shooting, with a healthy sampling of everything in between. "Cloverfield Visual Effects" (22:31) is organized into ten chapters: "The First Attack," "The Brooklyn Bridge," "Crossfire," "Subway Parasites," "The Rooftop," "Beth's Apartment," "Grand Central Station," "The Landing Zone," The Bomb Run," and "Central Park." In addition to the aforementioned participants, the following craftspeople go on record: visual effects producer Chantal Feghali, visual effects supervisor for Double Negative Michael Ellis, computer graphics supervisor for Double Negative David Vickery, Maya technical director for Double Negative Diego Trazzi, lead technical director for Double Negative Dalia al-Husseini, effects technical director for Double Negative Pawel Grochola, pre-visualization supervisor for Third Floor Nicholas Markel, visual effects supervisor for Tippett Studio Eric Leven, visual effects producer for Tippett Studio Annie Pomeranz, digital matte painter for Tippett Studio Ben van Zastrow, layout & matchmove supervisor for Tippett Studio Devin Breese, animation supervisor for Tippett Studio Tom Gibbons, matchmove supervisor for Double Negative Sam Schwier, lead FX animator for Tippett Studio Joseph Hamdorf, effects artist for Double Negative Adrian Thompson, compositing supervisor for Tippett Studio Chris Marley, Clover 3D texture painter for Tippett Studio August Dizon, and character setup & rigging for Tippett Studio Eric Jeffrey. Whoa mama—are you getting the picture that the disc is reasonably comprehensive? "I Saw It! It's Alive! It's Huge!" (5:51) puts the focus on lead creature designer Neville Page, and Clover Fun (3:57) is a gag reel. The disc also includes four "Deleted Scenes" (3:34 with "Play All" option and optional commentary by Matt Reeves): "Congrats Rob" (:24), ""When You're in Japan" (1:25), "I Call That a Date" (:46), and "It's Going to Hurt" (:58). The "Alternate Endings" (4:34 with "Play All" option and optional commentary by Matt Reeves) are imaginatively titled "Alternate Ending 1" (2:09) and "Alternate Ending 2" (2:26). Though the Blu-Ray disc has no trailers, the DVD launches to the Star Trek teaser trailer (1:22) and the first Indiana Jones and the Kingdom of the Crystal Skull trailer (1:54). And the "Easter Eggs" (um, spoilers, for those who want to find the eggs on their own): "X Marks The Spot" (1:24)—found in the "Scene Selection" menu just above scene 10—shows a special effects sequence before "X"s were replaced with parasites. "Rack'em & Pack'em" (1:55)—a "you had to be there" cast-and-crew gag reel spoofing a line of dialogue—can be found on the "Setup" menu by clicking right at the "Español" option. Those patient enough to hang around the "Scene Selection" menu will eventually find that a "Chapter 17" magically appears, leading to "Supplemental Files." Click around to see four news videos covering a mysterious oil rig collapse: English (2:45), Spanish (2:40), French (2:29), and Japanese (3:01); the Slusho! website with commercial (1:05); and four nutty "Jamie & Teddy" webcam videos once seen on the world wide web: Video 2 (1:23), Video 5 (3:11), Video 9 (1:21), and Video 11 (:31). Happily, these hidden bonuses are located in the same places on Blu-Ray and DVD. All site content © 2000-2019 Peter Canavese. Page generated at 04/18/2019 09:55:47PM.